Look a little different around here?? For the past 8 months I have been using this blog as journal, an outlet, a way to share our families happenings with friends and family. I love looking back on old posts and reminiscing about things we have done and goggling over how little and different Taden was in the beginning. I love thinking of creative ideas and posts to share with those that read (thank you for reading!). And, I love having a reason to take endless pictures of my family (to share with you all, of course!). But, the thing I haven’t fallen in love with through this blogging process is my blog design and name – our brand. When I originally decided to begin a blog I didn’t know how I would use it or even how often I would write. I threw together a design and chose an original name that was available and just began. Nothing felt like it was “me” or “our family” but I just wanted to begin posting. For the past few months I have loved writing the posts, but cringe when I see them on my actual blog because I hate how they look on the final product. I am not good with change, but it was time! Hence all the changes around here!! For starters, our name AND url. Please check back for posts at www.caseyschaos.com. Our About is completely revamped! Check it out. A few of my social media handles have changed. Specifically, please note the change to THIS new Facebook page – follow it! The overall look is different. Please be patient with me as I review old posts and try to make them consistent with the new and improved look. I am finally excited about this blog and its look! I hope the new look is easier for you to use and more aesthetic to the eyes. Please check back often for regular posts, pictures and chaos! 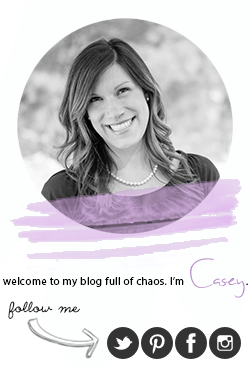 Or even better, follow me on Facebook, Instagram, Pinterest, Twitter, Google + and Bloglovin’ to keep up! There are lots of changes in store for my clan in 2014 and I am excited to share all of them with you. Thank you for reading what we find to be exciting (in reality I know they are not that exciting) adventures in our lives.